In addition to the Dark Lotus Teacup shown at right, we have five other new designs of these large cups with strainers including white bamboo, and red bamboo. Bamboo is one of the four gracious plants and represents integrity. 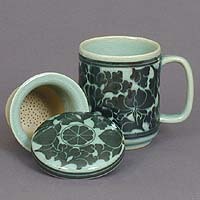 There are two red chrysanthemum designs one of which is a unique two red chrysanthemums design. Chrysanthemums symbolize health and well being. There is also a white lotus design which stands for the Sun and the mercy of Buddha. These large cups are perfect for steeping a single cup of green tea yet large enough for a big cup of Jo. In addition to the teacups we have a new style of tall teapot set with a dark chrysanthemum design similar to the teacup. Our tall teapots are perfect for steeping larger pots of teas in addition to green teas. See our entire selection of teacups with strainers here, our entire selection of teapots here, and all our new items here. Wild orchids are a symbol for refinement and decorate this two-tone planter which has drainage holes in the sides and an open bottom where a screen can be installed. A celadon planter is also available with a tiger design, the symbol for a guardian and charm, on one side, and a dragon, the symbol for the all mighty, on the other. Due to popular demand we have added two new Kaya-geum dolls in green and light-blue. The Kaya-geum, is a traditional Korean instrument developed in the 6th century in the Gaya Kingdom (one of the three kingdoms during the three kingdoms period). See our entire vase and planter selection here, all our dolls here, and all our new items here. Don't miss the chance for big savings on our sale items with discounts of over 20% on the Tall Flock of Cranes Bottle shown at left. Cranes are the symbol for immortality in Korean culture and are thought to bring longevity to the owner of the piece. More savings can be found on celadon rice wine sets, seven different designs of tall teapot sets, celadon wedding duck sets, which represent the bride and the the groom. After the wedding, they are often placed somewhere in the couples house and their position tells of the couples marital state. Nose to nose means the relationship is good, while tail to tail indicates some animosity. Learn more about the Korean wedding duck tradition here. Other sale items are our celadon tea containers, hanji boxes, which are traditional paper crafts made from the bark of the mulberry tree, small lacquered boxes, and celadon jars. See all our sale items here. The Korean alphabet (called "Hangul" in Korean) was developed by a team of scholars under King Se-jong (1397-1450) of the Yi Dynasty and is the most recently invented and most scientifically designed alphabet in the world. "Hangul" has only 21 vowel/vowel combinations and 19 consonants, 5 of which are the same symbol repeated twice and 5 of them are simply a consonant with the addition of an accent mark. That makes a total of only 30 basic character shapes to be learned. Due to western influence "Hangul" is often written from left to right and top to bottom like English, but historically was also written from top to bottom and right to left like Chinese. Consonant; "ㅎ" sounds like the letter H as in hotel. Vowel; "ㅏ" sounds like the letter A as in father. And the "ㄴ" here in the final position sounds like an N.
Here the letter "ㄱ" sounds like G because it is in the initial position in the syllable. Between the two consonants is the vowel "ㅜ"; it is represented by a U and sounds like the oo in Pool. And the "ㄱ" here in the final position sounds like a K.
Each letter of the alphabet is a simple shape that represents a sound. In the example at left the Korean letter "ㅎ" sounds like an H as in Hotel. The next letter in the example is the vowel "ㅏ" which sounds like the letter A as in father. The final letter in the first syllable is the "ㄴ" which sounds like the letter N. So the top syllable to the left sounds like Han. Some characters change sounds or just have a harder sound depending on their location in the syllable. The lower syllable in the example starts with the letter "ㄱ" which sounds like a G in the initial position in a syllable and like a K in the final position. The next letter is a "ㅜ" which sounds like the oo in the word pool. The last letter is the "ㄱ" again which sounds like a K since it is in the final position. So the sound of the second syllable is Guk. Guk is the Korean word for country and both syllables together make the sound Han-guk (한국) which is the word for Korea. Each word in Korean is broken down into syllables which are composed of 2 to 4 characters, such as the two above which each have three syllables. Learn more about the Korean alphabet here.